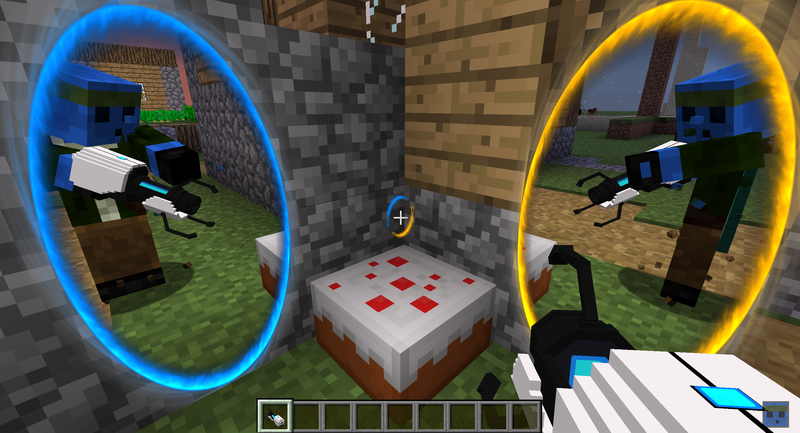 So I don’t know if you caught it but I released Portal Gun for Minecraft 1.10.2 yesterday, but I didn’t get round to writing about what’s new. This is going to be a bit of a long post as I write about what’s new with Portal Guns and what’s planned for the future, and it will get a little technical. A bunch of screenshots I’ll be showing here will be from the development version so you get a little bit of insight on the process as well. The image used to announce the release of Portal Gun. So I’m sure a lot of you have noticed, but you can see through the portals again. This work is a combination of what you guys saw in Doors and what you guys saw in Blocksteps. Code changes in Minecraft 1.8 however, essentially meant I had to rewrite most of the code that was from Doors again anyways. However, as these see through portals are what you would call a “live render”, your FPS will, effectively, be reduced by ~40-60% as what I am doing is essentially moving the camera and re-rendering the entire scene, with extra bits and pieces to make sure the render looks right. 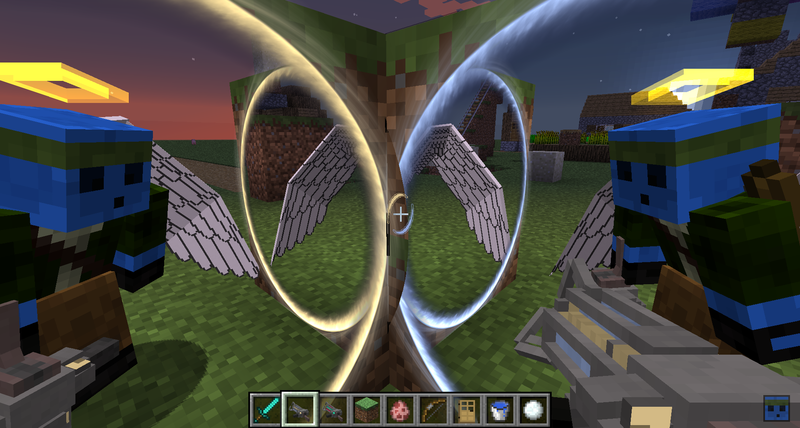 But on the bright side, you can see portals in portals! Recursive rendering works. But of course, FPS will tank. In-dev GraviPortalGun also seen here. 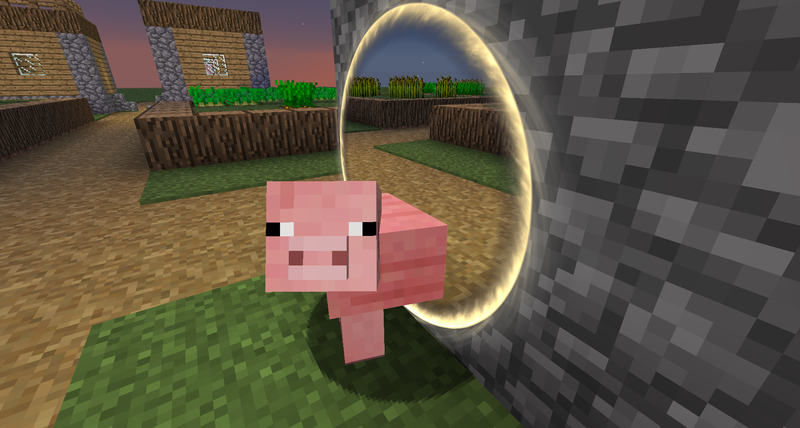 Portals also now have a new fancy portal border render made by amadornes, who helped make the shader that we’re using and some of the background code in how portals actually work. To try and accommodate for everyone’s various setups, there are a bunch of configs available for you to tweak. In the future there may be more added as I try and improve the performance or reduce the load on players. You can read the tooltips on the settings themselves to figure out what they do. Go to: Mods -> iChunUtil or PortalGun -> Config, and an in-game config editor like this should show up. Next up on the list, say hi to the new portal gun model by RazzleberryFox. You can already see it in the first image, but it also animates (to a degree) when you’re firing portals and grabbing blocks. However, the animation was rushed (the model was literally added and animated a day or two before release), and may be subject to change, but here, have some fancy in-dev shots of me getting the model in-game. I have made a monster. Say hi to the many-clawed portal-gun. Also to note, the portal gun core and indicator glows in the dark. Another thing to note is that portals will also render their outlines if they’re obstructed and you’re holding the portal gun of that type. I totally did not just place that block of grass and chicken just to show off the outlines. That’s pretty much all I have to say for aesthetics. I do have to add that for all of them to work properly, (getting technical here!) Minecraft has to think that you can use framebuffers, and your graphics card should be able to support stencil buffers and shaders. Unless your computer is incredibly old (or, if you’re using integrated graphics potentially), most of you should be perfectly fine. If not, drop me a message somewhere and I’ll try and troubleshoot it with you. Okay so for gameplay, the basic essentials hasn’t really changed. Shoot portal here, shoot portal there, speedy thing goes in, speedy thing goes out. Yes, your camera WILL roll when you go in through a portal in the ground/ceiling. Just imagine that you’re reorienting yourself after you came out of a portal sideways. I quite liked this picture actually. This was pretty much immediately after I finally got the entity renders within a portal working right. See next image. Entities in the portal had to be special cased to be sure they rendered on the “other side”. If they weren’t, you’d see something like this. Crafting, at the moment, still uses the same recipes. This is subject to change. There is something new I want to add later that I wasn’t able to put in due to time constraints. I will write about it in a bit. If you look at the tooltip for the portal gun you can kind of gather what I might be planning. Crafting a new portal gun will randomly create a channel for you with random colour allocations. Don’t like the colours? Keep crafting new portal guns. The “Global” portal guns, Chell, Atlas, P-body, can all be found in the creative inventory. That’s actually it for gameplay. It hasn’t really changed as much from the old mod, really. MC’s attack key for shooting left portal, MC’s use item key for shooting right portal, middle mouse to zoom, G for grab, R for reset, hold R and hit LMB/RMB for individual resets. (QWERTY layout). This is where it gets interesting. There will be a lot more text here rather than pictures. 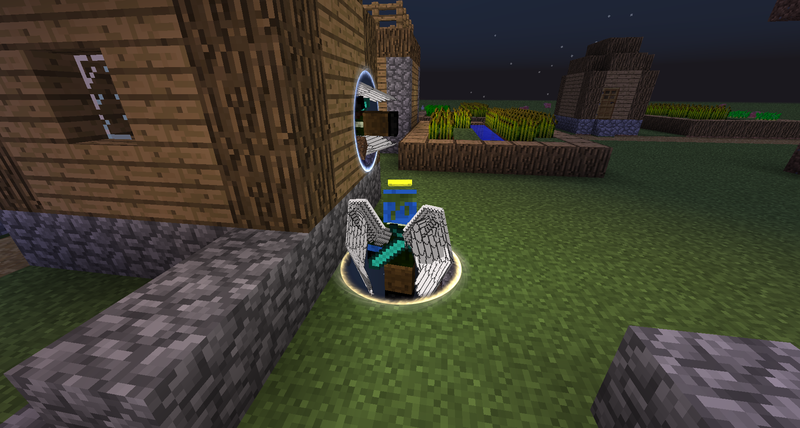 Trying to adapt a concept as gold as portals and the portalgun for MC survival is going to be hard. I have some ideas that I would like to share with you here first. For starters, portal guns are meant to be upgraded and their portals meant to be highly customizable. The rewrite was done with this in mind so most of the underlying structure is already there… There’s just no way to modify it yet. 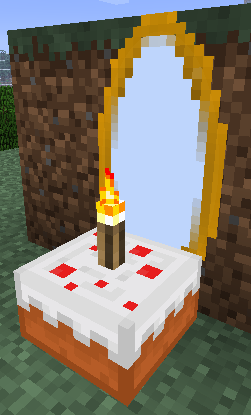 Firstly, portals will come in various shapes and sizes. I’m planning for the basic portal gun to start off as a simple 1×2 portal, upgradable in width and height individually up to 5×5. Next up, if you didn’t catch it when I mentioned “Global” portal guns, portal guns are meant to be a personal object now. When you make a portal gun it will be assigned to you and you can apply/create a channel and choose your own colours. A portal gun made and configured by a specific person will only provide access to that specific channel. Global portal guns are essentially a set of channels that aren’t locked to any particular player and is meant to be shared between one another on servers. For now, when you craft a portal gun, you are allocated a random channel with a random colour and a paired colour on the opposite end of the colour hue spectrum. You should be able to change these in the future. Speaking of crafting, I’m also targeting to make portal guns a mid-game item (because it can be upgraded over time), meaning the recipe will be changed to adjust for mid-game. Midgame here meaning vanilla of course, mod pack makers are welcome to change this recipe as they wish in the future and adjust the balance of it all. Feel free to drop me a message when the time comes on how you would like to discuss balance. Grab strength is also going to be an upgradable feature. For now I’ve gone and given you the strongest grab capabilities of the portal gun, close to combating the gravity gun in functionality, actually. In terms of the upgradable system. Portal guns and portals are likely to require fuel, and eventually upgradable to not require it. 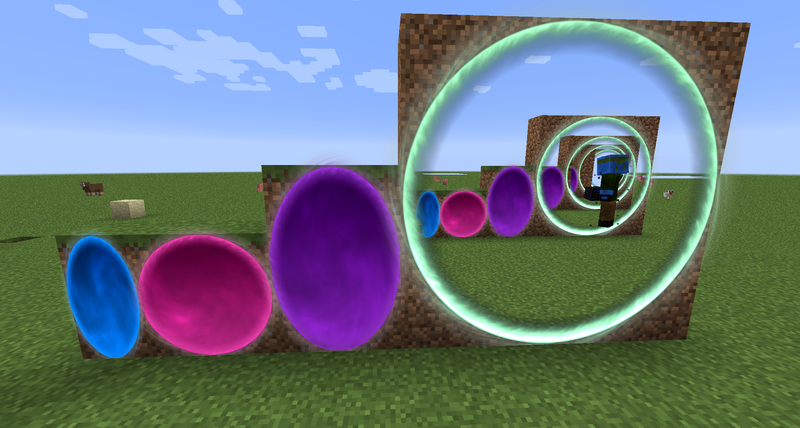 Though I understand some of you (myself included) might not like this change (you could say it’s not true to Portal lore), like I said, it is hard to try and adapt something like this for MC survival and to keep it somewhat balanced. A lot of the factors will be part of an upgradable system, fuel requirement, portal firing distance, portal upkeep/use, grab use, size, etc. I am, of course looking for feedback on this in the reddit post I’ll link below. I’m also thinking of changing the animation of the portal gun and the portal projectile renders. Those were rushed to meet yesterday’s release. That’s pretty much it for portal guns. Over time more elements of Portal and Portal 2 will be making a return as well, when I can get round to it. In fact, right now the mod uses Portal 2’s sounds rather than Portal 1’s (yes, there actually is a difference). Soo… besides that, you might have seen mention of something called “World Portals” in the config screenshot earlier. What is that? It is a part of iChunUtil, and essentially, is what powers the portals in the mod. It does the rendering of another perspective, the teleportation, those sort of things. It basically permits illusions like this, this, and if tweaked properly, could be as powerful as this (note that this mod is discontinued). Devs, you can find the source code here. Temp branch, soon to be pushed to master. 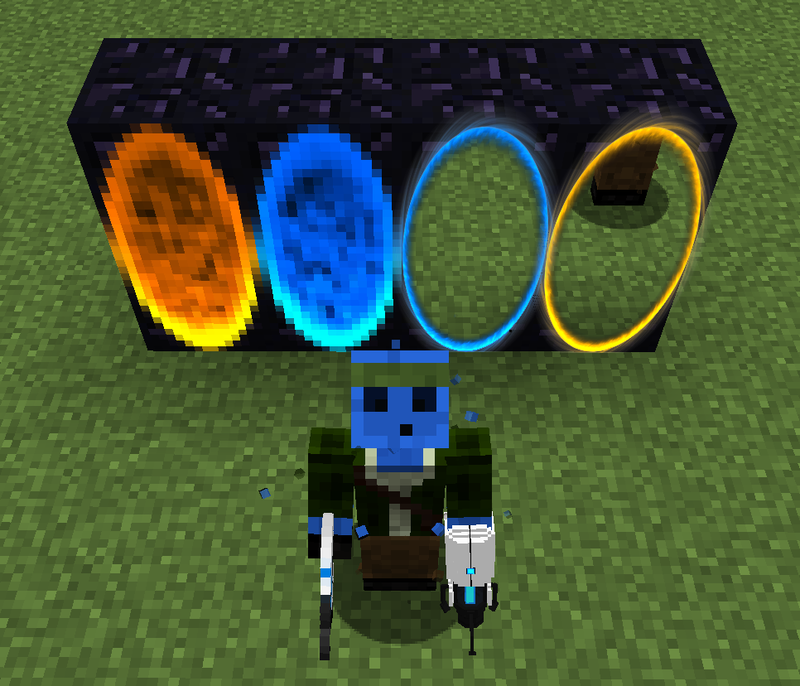 Eventually, I will write a mod that will allow people to take full control of World Portals. I could see this really being a very interesting and powerful concept to play around with in the future but that’s for a different time. Lag when you pair a set of portals. Parts of the world will not render if there is camera roll involvement. You can’t grab entities through portals and there’s no interaction with Gravity Gun yet. You can’t shoot portals through iron grills. We’re lacking a lot of aesthetics and config options as well. Dispensers do not fire portals when triggered. Fancy Portals config does not work. This mod took an excruciating amount of time to rewrite. Part of it was already done last year, as some of you may remember. Unfortunately, I got burnt out working on it and shelved it. About a month ago I took it out and blew the dust off it and the result of continuing that work is what you see out now. Personally, I feel like I spent more time on it over the last month than I did last year. 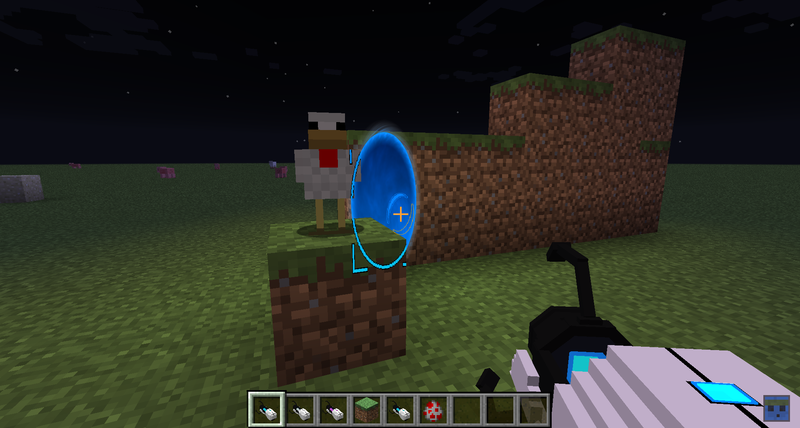 Both World Portals and Portal Gun are not easy mods to write. As I stated yesterday, I felt that this release was not up to my usual standard of mod releases. I sought the help of several developers on stuff I had trouble on and not many could help me solve those issues proper. I will have to admit, that I am pooped out once again and will have to take a bit of a break to focus on life and recuperate. I will be spending the next few days trying to fix issues with the mod reported, with the main issue tracker being here. I won’t be able to get the server crash fix out today, it’s a little more complicated than I expected but I’ll try and tackle it tomorrow instead. After that, development will slow, but hopefully be steady. amadornes for working on the code and the shaders. RazzleberryFox for the portal gun model. Gigabit101 for testing. heldplayer for trying, and for listening to all my rants. euclideanspace.com for massively helping me figure out quaternions. The various others who knew I was working on this but kept it a secret. Apologies for those who I’ve left out though, and to Darkosto for dealing with my teasing. That’s all for now. Gonna take a breather. I generally don’t respond to comments on this site, so discussion will be over here on Reddit. I’ve been rushing like crazy to try and get this release out, and it’s 20 minutes to midnight and I was supposed to pop out like 10 minutes ago. 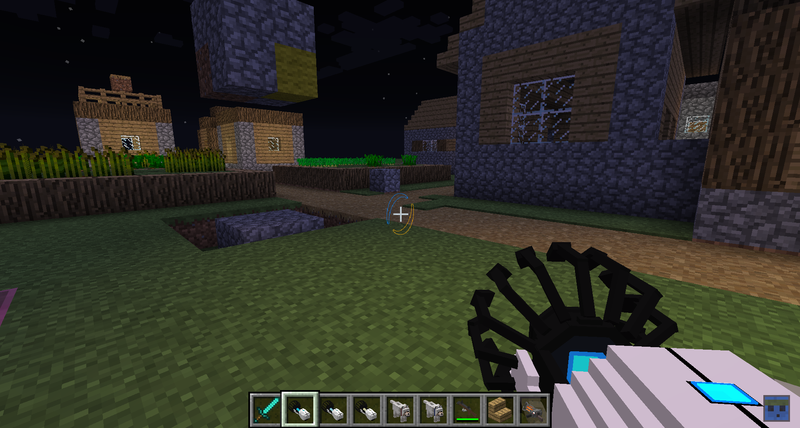 Anyways, Portal Gun’s now available for Minecraft 1.10.2. Requires iChunUtil 6.3.0. Get it here. I’ll write more later. HOWEVER: Do note that although released, there are still many changes and alterations and known issues that I’ll have to address as time comes. Notable: Portal rendering can be finicky at times and flicker. You can’t grab entities through portals. You can’t shoot portals through iron grills. 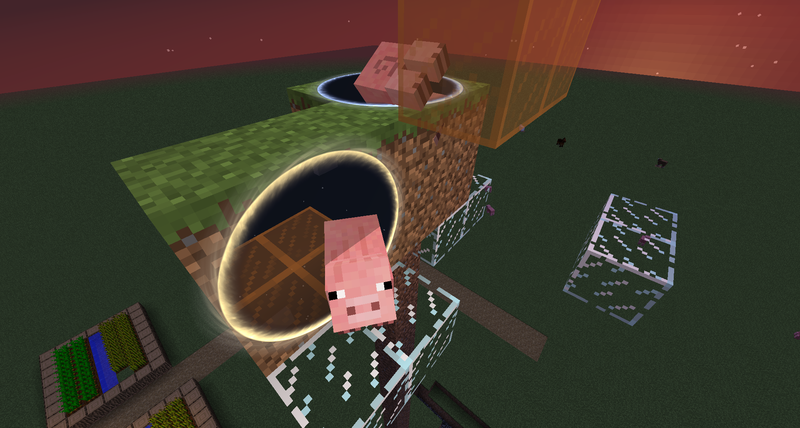 You can’t (I don’t know, I didn’t try) use portals over long distances (yet!). Having a new pair of portals can occasionally lag the client (badly!). Lacking a lot of particles and effects. Recipe for the moment is as in the old mod, still subject to change. Portal projectile render may or may not be final. Again though, like I said, gotta run, I’ll write later! Discussion (issue reports, suggestions, anything in general) over here on Reddit! EDIT: I feel the need to add that the mod is very much so still a WIP. A lot of issues need to be ironed out and I feel that this release actually isn’t up to my typical standard, but I’ve been targeting a release for PG today for over a month now and here it is. So for now, enjoy. EDIT2: The mod is crashing on dedicated servers! My bad! I’ll fix it tomorrow. 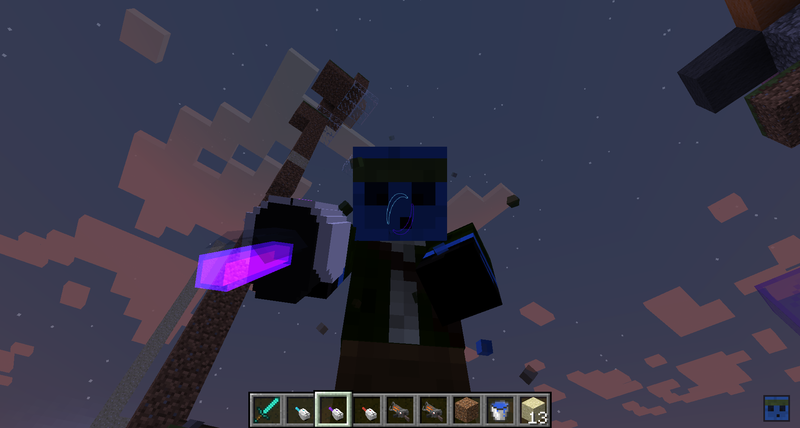 With the introduction of an off-hand slot in Minecraft, you could hold things in both left and right hand. With some of my items that have a left and right click function, this clearly got in the way. My solution to that is to basically introduce two-handed items. These two-handed items need the off-hand (or main hand, if you’re holding in the off hand) slot to be empty. If you were to hold another item whilst holding a two-handed item, you will bring the two-handed item down and will not be able to use it. Right now, these cover Gravity Gun, Bee Barker, Torch Gun, Torch Launcher, Pig Launchers. Yes, as much as you might have wanted to possibly use two Bee Barkers at once, that’s not happening. In the future, I can see Portal Gun also being such an item. Anyways, that’s all for now, have fun. – Item models makes a return, with much difficulty. – Reimplement several helper methods. – Add two-handed item handling, for use of several mods. – Fix improper month check causing events to occur a month late. – Fix patron effects locking if changed too rapidly. – Fix improper rendering of the EntityBlock entity. – Updated for Minecraft 1.10.2. – Now require Java 8+. – Primary Items in each mod are now two-handed items. – Fixed lighting issues in the world and in the GUI caused by rendering a back tool. Portal Gun turns six today! Happy birthday Portal Gun! 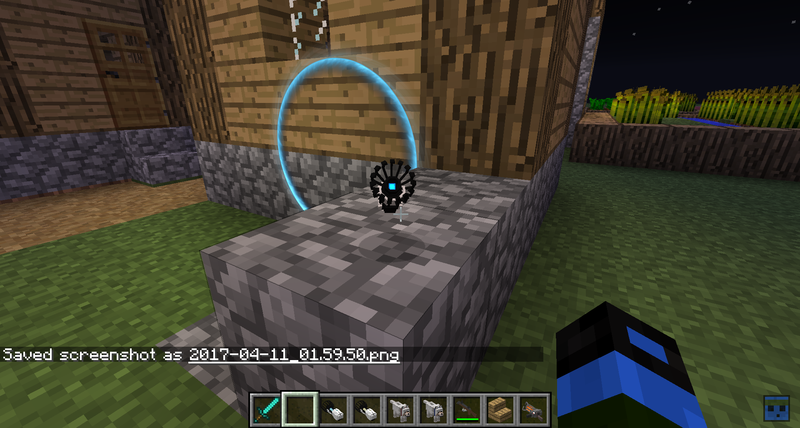 It was six years ago today that I released the first ever version of the Portal Gun mod for Minecraft 1.3_03 beta, and man, time has has passed. 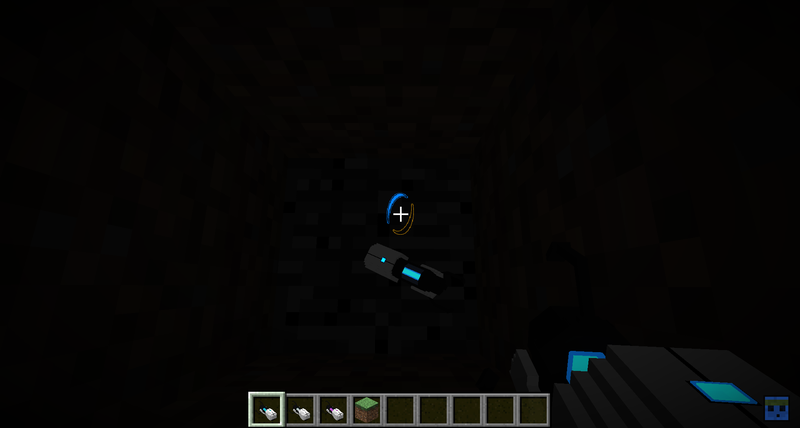 Sadly, Portal Gun has not had an update for over year now, and is not on the latest version of (modable) Minecraft. That is actually partially the reason I’m writing this post. I first wrote Portal Gun in my last year of high school. Back then I had a lot of free time. Over time I released more and more mods to the point that I’ve lost count on how many I’ve even made. I’ve gone through college, and I’ve midway through university now. Many thought, with my history and experience with photo editing, various scripting languages and Minecraft modding, I would have gone into Computer Science or a computing field. I went into medicine. And if you didn’t know, medicine is a really long course, and a tough one at that. It ranges from four to six years and I’m only just a bit more than halfway to a medical degree now. Understandably so, my free time began to lessen as time went by. More time had to be allocated to working towards my degree and less time for other things such as Minecraft modding. Even now as I write this I think about several case write ups I have to prepare after this post. I won’t bore you with the details but I can assure you I am happy where I am now. Anyways, my point is, I can’t mod as much as I used to. I still want to, but my lack of free time limits me from doing so. I do have every intention of updating my mods to the latest modable Minecraft version when I can, but that’ll be a slow process. If, on the mod page, it does not state that the mod has been discontinued, I will at my best ability, try to update it whenever possible. Why don’t I give them to someone else to update? People have offered. People have also tried to do so themselves. But I have declined them. My mods, my work, they all have a very special meaning to me. They have brought me much joy (and frustration), connected me with some of my bestest of friends from all around the world, gained me people that I know I can trust in a heartbeat. To hand them over to someone else would be, to me, admitting defeat. 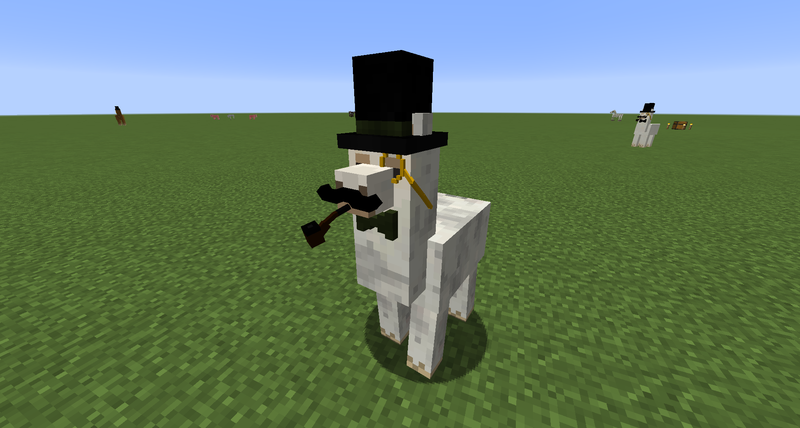 I have, however, stated that if I finally decide to hang up my hat, I will release the sources for all my mods. But until then, I will handle updating them when I can. That’s really all I have to say at this time. Now, back to those case write ups.